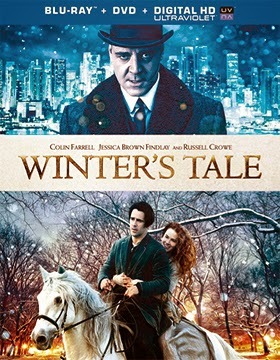 Warner Home Video was busy this past week with new release announcements for writer/director Akiva Goldsman’s film adaptation of Mark Helprin’s 1983 novel, Winter’s Tale, two new Elvis film transfers destined for the Blu-ray format and more. It took over 30 years to bring Helprin’s romantic “out of time” tale to the screen … and for good reason, it is a film that is difficult to translate to the screen. Call it a fairytale set in a mystical New York City, with an evil demon (played by Russell Crowe), star-crossed lovers (Collin Farrell and Jessica Brown Findlay), a flying horse and miracles. Unless one is familiar with the book — and with a 30-year gap since its publication — it is perfectly understandable that the film underperformed in its recent theatrical run, pulling in just $12.6 million. Now comes the home entertainment push, where Warner Bros. has the opportunity to pick up some tasty DVD and Blu-ray/DVD Combo Pack sales (both SKUs featuring UltraViolet) as Winter’s Tale would seem to be much more conducive for sales action in this venue. The street date selected is June 24 … with that late June date the ARR works out to 130 days. Bonus features include the production featurette titled “Winter’s Tale: A Timeless Love,” with additional scenes and a second featurette titled “Characters of Good & Evil” exclusive to the Blu-ray/DVD Combo Pack. Shifting to Aug. 12 there will be a celebration for Elvis fans as two of his films have been selected for special edition Blu-ray Digibook treatment. 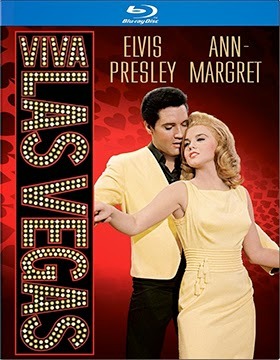 Viva Las Vegas 50th Anniversary Premium Digibook, teaming Elvis with Ann Margaret, includes the featurette, “Kingdom: Elvis in Vegas” and commentary from rock journalist and the author of “Elvis in Hollywood,” Steve Pond. 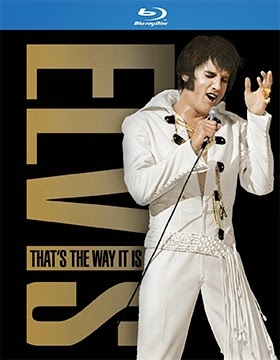 The newly-remastered Elvis: That's The Way It Is arrives as a Blu-ray/DVD Combo Pack special edition, with the Blu-ray disc sporting a newly restored presentation of the film (as well as the original theatrical cut), the featurette titled “Patch It Up: The Restoration of Elvis: That's The Way It Is” and 12 outtakes showcasing various song and non-musical sequences. The companion DVD disc features the 1970 theatrical cut. Also added to the release calendar this past week is a newly-remastered collection of Snoopy, Charlie Brown and Lucy animated tales. The double-disc collection, titled This is American, Charlie Brown, will be available on June 17. Also on the kidvid front look for Challenge of the Gobots (a four-disc set) on May 6 and on May 13 the DVD release of The Jetsons: Season 3 will be available. Mill Creek Entertainment will unleash a bonanza of priced-to-collect DVD selections during the month of June. Added to the selections announced last week — the 26-disc mega set of 100 Greatest Martial Arts Classics and the 25-disc mega set of 100 Greatest Cult Classics for a June 10 delivery to consumers — are seven additional DVD selections. These are: 10th Anniversary Series: Baadasssss!, 15th Anniversary Series: Go!, 20th Anniversary Series: Wolf, 25th Anniversary Series: Who's Harry Crumb?, 40th Anniversary Series: The Lords of Flatbush and both the 13-disc, 50-film collection titled B Movie Blast (counted among the selects are The Beach Girls, Death Machines, Galaxina, My Mom's A Werewolf and Stanley) and the 13-disc, 50-film collection titled Iron Fist Frenzy (Bruce: King of Kung Fu, Drunken Tai Chi and Kung Fu Genius can be found here). The following week, June 17, Mill Creek Entertainment is back with no less than 14 DVD SKUs. There are 13 film collectibles — all priced at just $9.98 each — that include: Can't Hardly Wait, Doctor Faustus, Finding Forrester, Flatliners, Ghosts of Mars, Look Who's Talking Now, Lord Jim and True Believers, plus double features titled Animal Combo Pack (teaming Born Free with Living Free), Buddy Combo (sporting the double-bill of Loose Cannons and Another You) and Switcheroo 2 Movie Pack (showcasing Like Father Like Son with Vice Versa) … and lastly two, three-disc, 12-film collections (yes, these too are priced at just $9.98 each) titled Great Impersonators (featuring such films as Enter the Game of Death, Kung Fu Warrior and Marvelous Stunts of Kung Fu) and Way of the 5 Finger Death Strike (included are Five Kung Fu Daredevil Heroes, The Rage of Wind and Ring of Death). WOW! But, we are not done yet! The following week, June 24, it is time for some new TV-on-DVD selections. Heading home on this last street-date Tuesday during the month of June are: Bewitched: Season Three and Bewitched: Season Four (both three-disc sets), The Larry Sanders Show: Seasons 1 & 2 (also three-discs) and The Partridge Family: The Complete First Season and The Partridge Family: The Complete Second Season (both of these collections are double-disc set). 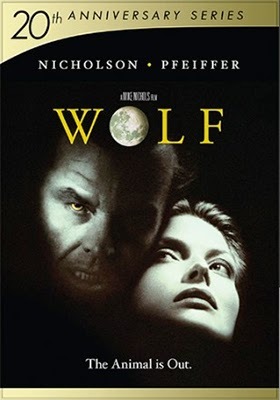 For more information on these June DVD selections from Mill Creek Entertainment please visit the company’s web site at: http://www.millcreekent.com. With director/producer John Stockwell’s Kid Cannabis in place for a DVD and Blu-ray push on July 8, Well Go U.S.A. has bracketed that early July street date with two new thrillers from the Far East. 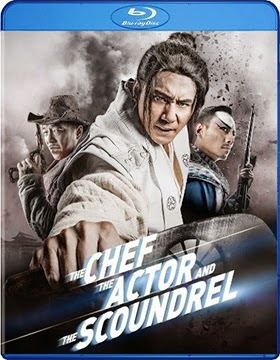 Added to the release calendar on June 24 are DVD and Blu-ray editions of writer/director Guan Hu’s acclaimed World War II action/comedy, The Chef, The Actor, The Scoundrel (in Mandarin with English subtitles). Pi Zi/The Scoundrel (Huang Bo) is a wheeler-dealer in Japanese-occupied Beijing (circa 1941), who quite by accident captures two Japanese bio-terror scientists and plans on holding them for ransom — he imagines a large payout. It’s a simple plan, but the wheels quickly come off when he finds himself and his hostages trapped in a restaurant run by Chu (Liu Ye), his wife (Liang Jing) and part-time actor/restaurant worker Xi/The Actor (Zhang Hanyu). With the help of his new friends Pi Zi soon discovers that the two scientists are worth far more for the cure to the cholera epidemic that they possess … but how to get the information from them, that’s the trick!!! 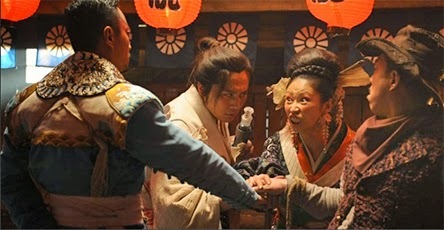 An elaborate “Kabuki–style” charade unfolds (think: a life-and-death version of Andy Hardy and Judy Garland putting on a show) as the trio have to outwit the scientists and what seems to be the entire Japanese army to find the cure, collect their booty … and, oh yes, stay alive! Jumping to the other side of the Kid Cannabis window we find writer/director Won Shin-yun’s Korean-language import, Suspect, hitting retail venues on July 22 as both DVD and Blu-ray product offerings. Suspect is an all-out, no-holds-barred action thriller — guns, cars and hand-to-hand combat! So buckle up and hang on tight! Ji Dong-chul (Gong Yoo — Silenced, She’s On Duty, etc.) is a former operative from North Korea who lost his wife and daughter (murdered) and escaped south. That’s the quickie backstory. Instead of working his skills for the South Korean government, he has taken a job as a chauffeur, which gives him the cover necessary to track down those who were responsible for the murder of his family. One of his clients has been helping him, but when he ends up murdered all arrows point to Ji … he’s being set-up and both the good guys and the bad guys are suddenly hot on this tail. From this starting point Suspect just rips along (Ji Dong-chul is sort of like Dr. Richard Kimble in The Fugitive … everyone is after him). Producer and award-winning documentary filmmaker John Edginton’s insightful look at Syd Barrett (the co-founder of the legendary rock band Pink Floyd), The Pink Floyd and Syd Barrett Story, will be heading to the DVD market place on May 20 as a double-disc special edition release from Eagle Rock Entertainment. 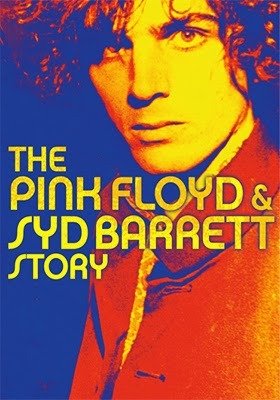 Produced back in 2001 for the BBC’s Omnibus series, when Barrett was still with us, this updated presentation expands that truncated TV version (just 50 minutes) and includes “Roger Waters on Syd Barrett,” with the film itself showcasing early TV appearances and rare home movie footage. The second disc packed with interviews with Pink Floyd band members — Roger Waters, David Gilmour, Nick Mason and Richard Wright — and more! 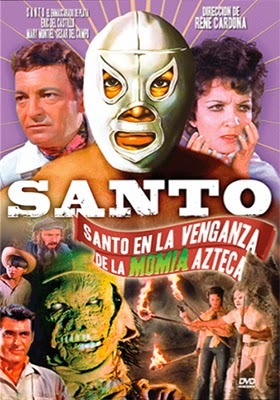 Santo returns on May 13 in three classic horror-themed adventures courtesy of VCI Entertainment. Santo (aka: Rodolfo Guzman Huerta), the legendary masked wrestler from Mexico, subject of comic books and star of over 50 films featuring his “super hero” persona of El Santo is every bit as popular today (some 30 years after his death) as he was during the glory days of his film career. With four already released on DVD (Santo Contra la Hija de Frankenstein, Santo Contra Los Jinetes del Terror, Santo y Blue Demon Contra Dracula y el Hombre Lobo and Santo y Blue Demon Contra el Dr. Frankenstein) with their original Spanish-language tracks, it’s time for the series to expand with three more of this film vault collectible treasures. 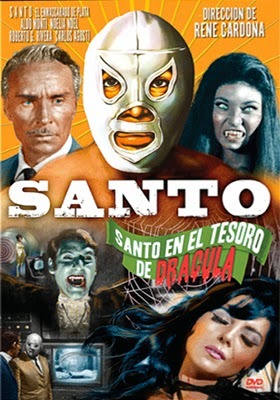 First up is the 1969 film release of director René Cardona’s Santo en el Tesoro de Dracula, which features both time travel (MGM’s The Time Machine was released in 1960 so the invention of “El Orificio del Tiempo” was fair game) and the legend of Dracula (the Hammer horror cycle was going strong during this period with Christopher Lee as Dracula), which made this tale of the lost treasure of Dracula the perfect combination to thrill Santo’s legions of fans. Aldo Monti starred as Dracula, with the sultry Argentinian Noelia Noel (Carnival of Crime, Night of the Bloody Apes) on hand as Luisa, Santo’s girlfriend and time-travelling victim of the bloodsucker ... can our hero save her from the fiend, win the big wrestling match and restore the space-time continuum by film’s end? Next we find Santo en la Venganza de la Momia (also directed by René Cardona) and released in 1971. After a championship double-team match in Mexico City, our hero heads out on an expedition to explore some ancient ruins. This adventure will prove to be fatal for most of those taking part as they unearth the tomb of Prince Nonoc, a cursed and rotting mummy! The action is neatly bookend with a titanic death match at the film’s conclusion which pits Santo against the La Momia! Lastly, Santo en la Venganza del la Llorna (aka: Vengeance of the Crying Woman) is a 1974 film release directed by Miguel M. Delgado (who wrote and directed several of the Cantinflas comedies). Santo is once again on an expedition to explore another lost tomb — the tomb of Eugenia Esparza — with the noble purpose of using any treasure found to help small children. 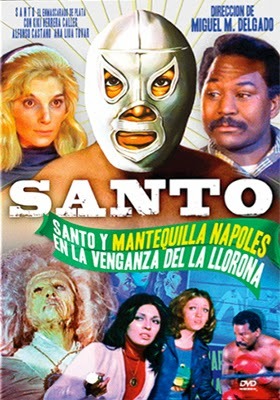 When not helping his friends battle the deal-with-the-devil evil mummy that they’ve raised from the dead, Santo and his sidekick, Idem (Cuban-born World Welterweight boxing champion José Mantequilla Nápoles), have to take on real-life villains who are out to steal the treasure for themselves! Breaking Glass Pictures will be bringing writer/director Henry Jaglom’s last film release, The M Word, to DVD this coming June 17. A theatrical break is slated for late April (to increase awareness and critical buzz), but some of the early reviews are already in and they are calling The M Word one of Jaglom’s best films yet … and that’s saying something for a filmmaker who stormed onto the scene in 1971 with A Safe Place and has followed with such delights as New Year’s Day, Eating, Last Summer in the Hamptons and Just 45 Minutes from Broadway. 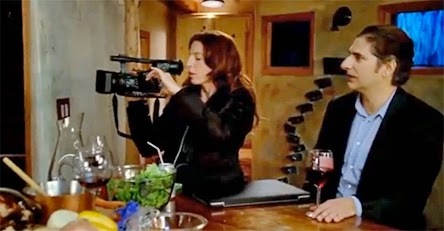 And once again he teams with Tanna Frederick (he’s directed and she has starred in Hollywood Dreams, Irene in Time, Queen of the Lot, Just 45 Minutes from Broadway and now The M Word) and once again the screen comes alive with her performance. Moxie Landon (Frederick) works at a Los Angeles TV station on some inane kid’s program, but she has plans for moving into a producing role with programming that she hopes to develop (related to a specific issue relating to women). Enter corporate hatchet man Charlie Moon (Michael Imperioli — The Sopranos), who is on the prowl for some financial shenanigans, but is also under orders to cut dead weight. That’s the dynamic — a head-butting dynamic to be sure (where opposites attract). It’s great fun and Jaglom has assembled a terrific supporting cast that includes Eliza Roberts (sans hubby Eric Roberts), Corey Feldman, Frances Fisher, Gregory Harrison and Mary Crosby. 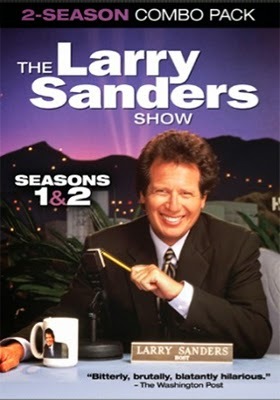 Bonus features include commentary teaming Jaglom and Fredrick (with other unspecified cast members) and outtakes. 20th Century-Fox Home Entertainment has tabbed June 3 as the street date for Blu-ray and DVD editions of director Christopher Spencer's Son of God. The ARR comes in at 95 days and domestic ticket sales currently stand at $59.4 million. 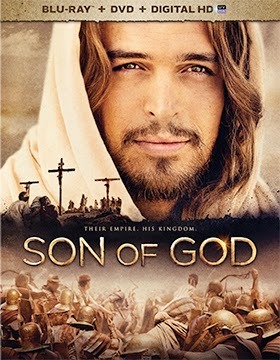 Despite a relatively unknown cast (Portuguese actor Diogo Morgado reprises his role as Jesus from The Bible mini-series), Son of God managed to generate a decent box office take and mainly positive reviews.